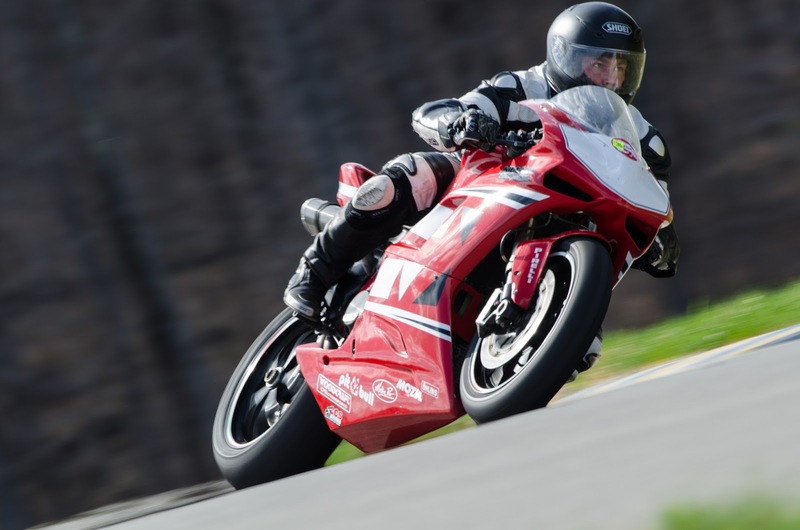 My buddy Jeff and I had been planning on racing Ducati Motorcycles at New York Safety Track for months now, having joined a race outfit called EvolveGT back on Black Friday last year, which gives discounts on track days. And today was the day! I got my tires situated late this past week at my Jeff's place in Long Island, but my track bike storage plan for the summer is pretty much to tip my garage attendants well and hope pray they let me keep the bike in the bed of the truck. Jeff had taken off Friday, but I could only leave work a little early, so I go on the road out of NYC around 5pm. Leaving Manhattan is miserable on a Friday night, so by the time I got up to Oneonta, it was nearly 11pm. Some friends from MotoFellas, a non-Ducati specific riding club out of NYC, let me know the Super 8 motel was the cheapest option, so I booked a room and crashed as soon as my head hit the pillow. I was in Harpersfield by 7am to meet Jeff and go through tech inspection, who had graciously saved me a parking spot to set up my canopy and set up my bike. Going to the track is awesome with friends, especially if you have a buddy who's a wrench, and I couldn't thank Jeff enough for helping me get set up for the track. The safety techs almost failed my bike, saying I blew a fork seal, which initially scared the crap out of me until we realized that there was just a little oil on the forks from being compressed all night. I'm running intermediate to start this year, and I was really nervous on two counts. 1. This race bike runs GP shift (one up; five down), and I nearly crashed the bike test riding it the first two times and 2. I've done a couple track days, but Intermediate on a new bike could potentially be a little hairy. I've been out with a number of riders who've done many more track days than me and still run novice, but my first session (Evolve typically runs four, fifteen minute sessions, breaking up experts, 2 intermediate classes, and an beginner session) allayed all my fears. The first two sessions of the day run parade laps, meaning you can't really pass, and I really appreciate easing into the day, as I really burned myself a couple years ago telling a track coach I "was experienced." And I wasn't really slow.. I ran towards the middle of the group, not as fast as some, but definitely faster than others (even though my goal is strictly to improve my own performance, not to best anyone else). I am out of shape though, and incredibly rusty from the Winter and this long, cold Spring. There are a lot of cobwebs beginning the season and people were going down at every session. Jeff's bike looked ok (and he was fine... well maybe not his leathers), but he bent the tabs on the frame that hold the rear sets, which he's quick to point out are simply sheet metal with a nut stamped inside. Jeff is pretty handy with metal, and borrowed a blowtorch from the service guys, only to discover after heating up the frame tabs and bending them that the metal had cracked. We hung out for the day, but Jeff's track weekend was done; though he found some SpeedyMoto steel frame tabs online and a welder to mount them on the frame. My first session after lunch was excruciating, after a big sandwich and adrenaline and exhaustion tapping all of my strength. But the session after that, and the second to last session were my best of the day, finally beginning to feel confident on this beast of a bike. Jeff and I had a beer and bid him farewell, pitched my tent for the night, and joined my buddy Dan and his girlfriend for dinner at this awesome restaurant called the Autumn Cafe in Oneonta. I could barely walk, while one of the guys at the track did tricks in his airplane in the sky. I crashed around 10pm, only to wake up soggy at about 4am, realizing that Sunday might not happen due to rain. I cancelled my track day reservation (another perk to EvolveGT membership), as not only was I soaked to the bone, the forecast for rain extended all throughout the day. I felt like a little bit of a wimp, but nearly everyone else cleared out except for one guy with rain tires on his bike. I did meet up with some old friends Andres and his buddy Keith, both camping and rocking 1098s as well, and got a chance to meet a bunch of the fellas from MotoFellas, before turning back to NYC. This Pani is for sale for $6500 if anyone is interested.